As street art continues to gain legitimacy as a contemporary art movement throughout the world, New York City remains its cradle of birth and continues to attract artists from around the globe. Gingko Press’s recently published Outdoor Gallery — New York City by author and photographer Yoav Litvin bears witness to the unmediated and diverse creative expression of New York City’s street art. Thought provoking, comprehensive and aesthetically pleasing, Outdoor Gallery presents hundreds of street art photographs, accompanied by interviews, featuring more than forty artists. The author provides us with a rare opportunity to view the artists’ actual process. Yoav photographs artist Adam Dare’s steps as he installs his signature bunny paste-up on scaffolding in the dark of the night. Jilly Ballistic, known for subway site-specific images, also agrees to guide us through a 9-step process of pasting an image of a city officer in the Astor Place metro station. Although most of the photographs are taken soon after the images have surfaced, Yoav eloquently emphasizes the ephemeral nature of the art form in his opening commentary and throughout the interviews he conducted. He also reminds us that street art is continuously at the mercy of many factors, such as neighborhood gentrification, weather conditions, vandalism and police intervention. Photography serves as an ally in keeping the art works alive after they have faded or disappeared. This book provides remarkable insight into the motivations and the creative process of dozens of street artists whose works have surfaced in NYC. More than shedding light on the extraordinary talent of these artists, Outdoor Gallery inspires readers to discover for themselves the treasure trove of outdoor art New York City has to offer. 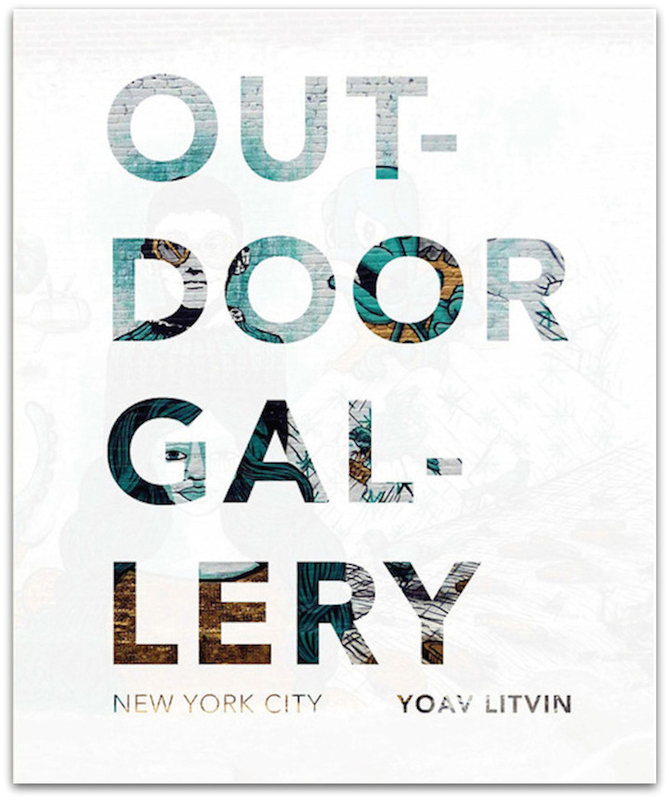 Outdoor Gallery — New York City can be ordered online at Amazon and is available from retailers worldwide including Low Brow Artique and Zakka in Brooklyn and Strand Books, the MoMA and Guggenheim Museum shops in Manhattan.